Lafayette and the Farewell Tour: Odyssey of an American Idol, a lecture by Alan Hoffman, delivered at the Yorktown Victory Center, June 8, 2015. 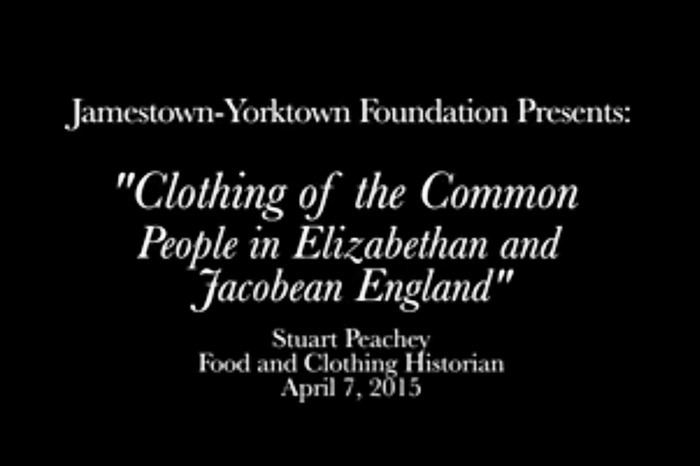 British historian Stuart Peachey presented lecture on “Clothing of the Common People in Elizabethan and Jacobean England” at Jamestown Settlement on Tuesday, April 7. Hear Lieutenant General Jonathon Riley, Ph.D., speak on the subject of his book “‘That Astonishing Infantry’: The History of The Royal Welch Fusiliers, 1689-2006,” a lecture presented on March 24, 2015 at the Yorktown Victory Center. Hear Lieutenant General Jonathon Riley speak about the history of the Royal Welch Fusiliers. Author and acclaimed documentary filmmaker Peter Firstbrook spoke in Jamestown Settlement’s Robins Foundation Theater on October 14, 2014, on the exploits and accomplishments of Captain John Smith, the subject of his new book, “A Man Most Driven.” Smith had an instrumental role in the survival of the early 17th-century English colony at Jamestown and published the first accurate map of the Chesapeake Bay region in 1612. LECTURE (June 2012): "Captains, Monarchs, Philosophers, and Merchants: Picturing the 17th Century" investigates the dramatic changes in 17th-century technology and philosophy that set the stage for the modern world, using works of art. Lecture by Twyla Kitts "Captains, Monarchs, Philosophers, and Merchants: Picturing the 17th Century" In connection with the Jamestown Settlement exhibition "The 17th Century: Gateway to the Modern World," Twyla Kitts of the Virginia Museum of Fine Arts (VMFA) presented this lecture at Jamestown Settlement on June 9. 2012. Kitts, curator for the exhibition, investigates the dramatic changes in 17th-century technology and philosophy that set the stage for the modern world, using works of art from the VMFA collection to illustrate the shifts in international alliances, economic competition and world view that are characteristic of this transitional age. Kitts is literary and teacher programs educator for VMFA’s Art and Education Department and collection educator for the Byzantine, Renaissance, Baroque, Fabergé and 18th/19th-century European galleries. She received a bachelor’s degree in Russian history from the University of Virginia. "Legislating Boundaries" by Lauranett Lee LECTURE (2012): "Exploring 17th-Century Virginia: Legislating Boundaries and Creating Culture" examines how the lives of women and Africans became increasingly circumscribed in 17th-century Virginia. Lauranett L. Lee, Virginia Historical Society curator of African American history, spoke February 12, 2012 at Jamestown Settlement. An examination of Virginia statutes illustrated how the lives of women and Africans became increasingly circumscribed in 17th-century Virginia. Dr. Lee discussed the ways in which focused legislation and cultural collisions produced a legal society and culture unique among the founding colonies. "The Archaeology of Slave Quarters in Colonial Virginia" Lecture by Patricia Samford LECTURE (2013): "The Archaeology of Slave Quarters in Colonial Virginia" examines what artifacts and physical remains of slave quarters, in combination with historical research, can reveal about lives of enslaved people. Patricia Samford, Director of the Maryland Archeology Conservation Laboratory, discusses the archaeology of slave quarters in colonial Virginia. Dr. Samford examines what recovered artifacts and other physical remains of sites where enslaved people once lived, in combination with historical research, can reveal about material circumstances as well as family and community, gender roles, spirituality, and acts of resistance and accommodation. "Development of Slavery in the 17th-century Chesapeake" by Lorena Walsh LECTURE (2013): “Development of Slavery in the 17th-Century Chesapeake” examines the evolution of techniques for managing enslaved Africans and the adaptations specific to the Chesapeake that Africans had to make to survive. LECTURE (2009): "The Shipwreck That Saved Jamestown: The Sea Venture Castaways and the Fate of America" provides an overview of "the tale of one of the greatest rescue stories in American history." Lecture by Lorri Glover “The Shipwreck That Saved Jamestown: The Sea Venture Castaways and the Fate of America” Lorri Glover, co-author of "The Shipwreck That Saved Jamestown: The Sea Venture Castaways and the Fate of America" and associate professor of history at the University of Tennessee, delivered this lecture at Jamestown Settlement on June 13, 2009, in the second of four lectures accompanying the "Jamestown and Bermuda: Virginia Company Colonies" special exhibition at Jamestown Settlement. She provides an overview of the 2008 book, “the tale of one of the greatest rescue stories in American history,” one that became the inspiration for Shakespeare’s last play "The Tempest" and ensured England’s continued commitment to colonization in the West. LECTURE (2011): "Werowocomoco: Seat of Power" discusses the archaeological investigations at Werowocomoco, the seat of power of the Powhatan paramount chiefdom. Lecture by Martin Gallivan "Werowocomoco: Seat of Power" In “Werowocomoco: Seat of Power,” Martin D. Gallivan, guest curator of the Jamestown Settlement special exhibition, discusses the archaeological investigations at Werowocomoco that have uncovered evidence of interaction with Jamestown’s colonists and the ways that the Powhatan Indians constructed a powerful, central place in Tidewater Virginia from A.D. 1200 through 1607. Dr. Gallivan, College of William and Mary associate professor of anthropology, has been involved in the archaeological research at the Gloucester County site since 2003 as part of the Werowocomoco Research Group and has written numerous academic articles on the findings. He received a Ph.D. from the University of Virginia. “Werowocomoco: Seat of Power,” a lecture by William & Mary archaeologist, Martin D. Gallivan.